Almonds. Do you love them as much as I do? Like I mentioned after making these almond butter blossoms, I have been on a huge almond kick lately. I almost always have almond butter and a bag of raw almonds in my kitchen. These spiced almonds with lemon and rosemary are just one of my recent favorite almond recipes. 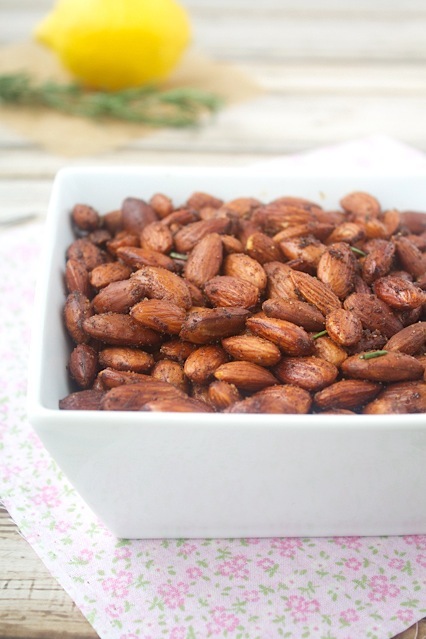 The almonds are tossed with a combination of spices including paprika, cayenne pepper and freshly ground black pepper. The spices are the perfect complement to the lemon and fresh rosemary, both of which are also tossed with the almonds before baking. The end result is an incredibly addicting snack. This particular recipe comes from a wonderful book, Almonds: Recipes, History, Culture. The book not only dives into the unique history of the almond, but there are also 60+ almond recipes and color photos to accompany them. If you love almonds half as much as I do, this is definitely a book you want to get your hands on. And guess what? A few of my blogging friends and I are giving away three copies of the book to our readers. Enter below for a chance to win! If you are interesting in learning more about the book, you can find more information here. This giveaway will be open from Monday September 22nd, 20114 at 9 am EST until Monday October 6th, 2014 at 11:59 pm EST. Three winners will receive a copy of the book Almonds: Recipes, History, Culture. Place the raw almonds in a large bowl. Add all of the remaining ingredients except the salt for sprinkling. Toss to coat. 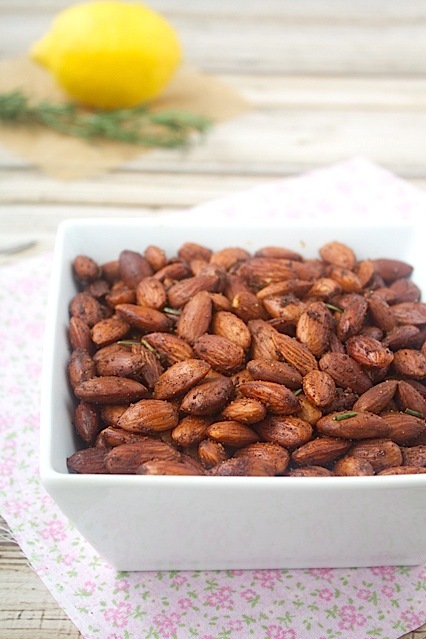 Spread the almonds in an even layer on a rimmed baking sheet. Roast until golden brown in color and fragrant, about 15 minutes. Transfer to a wire rack to cool completely. These look so flavorful and delicious! I think I could eat that whole bowl – what a perfect snack! I am sure I can eat an entire bowl of this!!! Seriously!! It is times like this that I wish I wasn’t allergic to nuts. This looks good! I adore almonds! Spiced nuts are my kryptonite 🙂 The lemon and rosemary sounds delicious!